Why do you think the Vietnamese banh mi, which essentially, is a French colonial product, becomes so popular in the west (and why now), whereas the French baguette sandwich isn't making waves? Andrea Nguyen is an author, freelance writer, cooking teacher, and consultant. Her blog -- Viet World Kitchen -- explores culinary traditions of Asia and has been a major contribution to the American food scene. Nguyen wrote several cookbooks, including "Into the Vietnamese Kitchen: Treasured Foodways, Modern Flavors," and the latest: "The Banh Mi Handbook," and the Wall Street Journal included it among their top picks for best cookbooks in 2014. Banh Mi, the Vietnamese sandwich, has been growing in popularity in America in the last decade, and it's a perfect "hybrid East-West food," she says. Below is my Q&A with Andrea Nguyen. Why do you think the Vietnamese Banh Mi, which essentially, is a French colonial product, becomes so popular in the west (and why now), whereas the French baguette sandwich isn't making wave? Who doesn't love a good sandwich? Vietnamese banh mi offer a wealth of textures (crisp bread! fatty mayo and meats! crunchy pickles! hot chiles! refreshing cucumber and herbs!). Plus, you can have it your way with all the elements. It's pretty, not heavy tasting, not overly mysterious for people interested in exploring new cuisines. People in the West are interested in new ethnic takes on familiar foods - witness the popularity of tortas and cubanos. Why not banh mi? It's the perfect hybrid East-West food, a great way to wrap your head around Vietnamese food. In Vietnam the banh' mi is the cheapest fare there - a breakfast for 50 cents. Are you surprised that it becomes a hit now in America? What else do you think is next from our array of dishes? I'm not one to support the notion that cheap food is a marker of good food. Someone is paying for the true cost of that food. In Vietnam, excellent banh mi sandwiches cost me between $1 and $1.50. They're made with care and good ingredients. It's all relative when you're in country. The 2012 average household income in Vietnam was around $5,000 USD. Banh mi isn't a household thing in America. It's still has a ways to go to become mainstream. What is it about Vietnamese cuisine that get so many foodies swooning - think Anthony Bourdain? But do you think the modern cuisine of Vietnam is essentially fusion given what the french brought to vietnam over the last 2 centuries? Bo Kho - Vietnamese beef stew - for instance is all about fusion, so it seems to me. Bourdain has helped to raise the profile of Vietnamese food but so has food media, food trucks, bloggers and cookbook publishing. Bourdain stands out because Viet people tend to look for validation from foreigners. It's likely the colonial experience. The French didn't like many Viet ingredients and dishes, my mother told me. Because of Viet history of foreign incursion, Viet cuisine tends to have an outward look. Viet people are good with embracing new ideas so it's natural for ideas to blend and become absorbed into the Vietnamese repertoire. The French are not the only foreign culture to exert its ideas on Vietnam. The Chinese were there for nearly a thousand years and they're Vietnam's next door neighbors. Geography invited contact with foreigners. There's a simplistic romanticism of Viet food as being one that's French influenced. The influences are much more complex and multicultural. That said, Vietnamese food attracts because it's varied in fresh vegetables, light flavors and people can more or less identify what they're eating. The fact that Vietnamese cuisine blends East Asia with Southeast Asia, South Asia and the West - lends it cross-cultural appeal. There's a lot to choose from: pho, ca kho, goi cuon, croissants, coffee and banh mi. You can eat all those Viet favorites in one day, maybe in one restaurant too. Okay, one mini-mall or walk around the block, depending on where you are. What is your favorite Banh Mi recipe, and bank Mi experience? 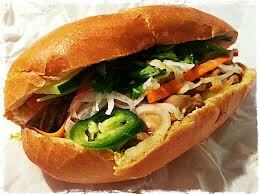 What is required for the best Banh Mi taste in your opinion? 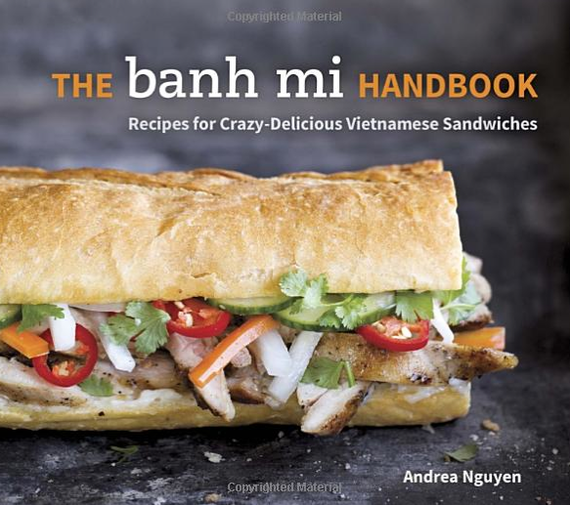 And readers response to your The Banh Mi Handbook? I love a good banh mi dac biet and have written about it on my site. It's a crazy, unexpectedly delicious combination of flavors, textures and colors. It screams, "I'm Vietnamese!" Many things are needed for good banh mi, not just the bread as some people claim. Fresh mayonnaise, Maggi Seasoning, protein with some salty oomph, daikon and carrot pickle (not just wimpy carrots! ), chile slices, cucumber, and fresh herbs such as cilantro. It's all those things encased in a light baguette-type bread. Non-artisanal, non-rustic bread works best to cradle the ingredients inside. The bread should never fight with the other components. It should not scrape your mouth. 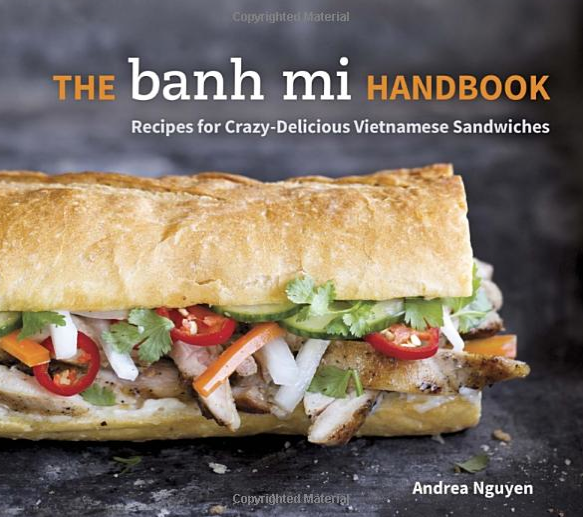 Less than a year after release, we are in the fourth printing of The Banh Mi Handbook. National Public Radio and the Wall Street Journal included the book among their top 2014 picks for best cookbooks. The recipes range from traditional to modern, meaty to no-meat. Most of the recipes can be made with ingredients available at a local supermarket - which is what a good sandwich ought to be about. I really like the book and am thrilled that readers like it too! What makes it essentially Vietnamese and not French? Seems to me Vietnamese have more variety in our sandwich than even the French - from meat balls to bbq pork to fancy pork to pate and ham etc. A French baguette is a simple affair and old school banh mi was too: bread, pate, salt and pepper. Maybe a little butter, if you could afford it. The modern, Saigon-style banh mi sandwich, invented in the 1940s, is loaded with goodies. Vietnamese people are hyper entrepreneurial and competitive. They're wanting to invent new things, adapt to locally available resources, use what's at hand. Ultimately, they desire good food. Banh mi bread is a staple food. Got canned sardines? Put some in for banh mi! Worked in Germany and eaten a lot of doner kebabs? Turn it into banh mi! Not everything works - like you don't want the filling to be super mushy. But when all the elements come together in a balanced fashion - 1:1 ratio of meat to vegetables, for example, banh mi sings. Vietnam's cuisine in Vietnam itself is evolving and last time I came back there were dishes I never had before and I wonder if you can comment on whether Diaspora and homeland's cuisines will be taking on divergent paths perhaps in a few generation. So true. It's hard to keep up with what's going on in Vietnam. McDonald's is there but people still eat banh mi with gusto. I search out thoughtful cooks to discuss what they're doing, how things are evolving. Some things stay the same because modern cooking tools and ingredients are not really readily available and affordable to people all over the country. Matcha is not mainstream in Vietnam but you can take a class on it in Saigon. I see non Vietnamese American stores selling Banh Mi and even Pho these days, and I wonder if this is a sign that ethnic has gone mainstream the way the pizza and lasagna of last century? My friends in food writing occasionally misspell banh mi as "bahn mi" and they'll put the diacritics on pho. However, both banh mi and pho are in the OED (Oxford English Dictionary). When the misspellings and accent marks disappear, those foods will be approaching mainstream-ness. America's population is over 320 million. There are many people who have yet to know of banh mi and pho. What gets you excited these days on the culinary scale? Working in food is exciting these days. There are many opportunities. I teach cooking classes, consult on Asian foodways and products, and write. Among my projects, the main focus is a pho cookbook that will be released in fall 2016 by Ten Speed Press/Crown. It won't be pamphlet! I'm very keen on that project because it's challenging and about one of my favorite foods. There are other projects going on too, such as meal kits that I'm developing with Chef'D. Food writers like me have several pots on the fire. It's for financial survival but it also keeps things really interesting. Andrew Lam is editor at New America Media and author of "Perfume Dreams: Reflections on the Vietnamese Diaspora," "East East West: Writing in Two Hemishperes," and "Birds of Paradise Lost."